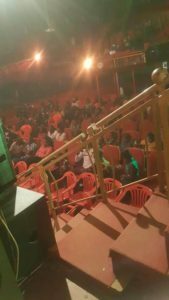 Empty chairs at Bobi Wine’s show. Photo by Paul Ibanda. The Dembe FM presenter, Eddie Sendi, who was the chief organizer of the Bobi Wine VIP show at theater Labonita on Friday is in immense pain after accumulating debts to organize a show that later flopped. PML Daily has learned that the musician-turned politician’s show flopped because it was over politicized and over rated with general tickets going for Shs50,000. A close associate of Eddie Sendi intimated to PML Daily that his counterpart (Sendi) is in hiding and trying to solicit for funds to pay back debts he accumulated as he organized the show that miserably flopped. By 9:00pm, Theatre Labonita had less than 200 revelers and hopes that the numbers would increase never yielded until the main act (Bobi Wine) had to be called on stage for performances. Meanwhile, most of the fans claim they would attend due to the ongoing threats of politicizing that musical show it scared them off and bared them from attending.